Our concern is not just about appearance. Traffic, wind, and shadows can have a major impact on the quality of our lives! 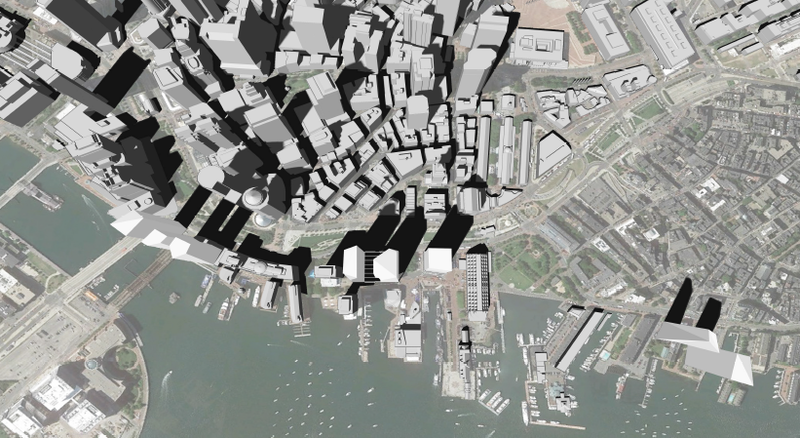 While we do not have shadow studies on every project being proposed on the waterfront at this time, we were able to attach a third party prepared depiction of the shadows if all projects were allowed to be 600ft., which is what the Harbor Garage is proposing to do. Please keep in mind, many of the other projects are not currently being proposed at 600ft., but this picture illustrates a worst case scenario if one assumes that a precedent of height is set and other developers follow assuming that the city and state approve. Shadows assuming other properties are developed to 600’. At rush hour, Commercial St., Atlantic Ave. and the main arteries of the Seaport District become parking lots. A traffic study conducted in December 2014 estimated how much additional traffic will be generated at just one of the proposed development sites: the Harbor Garage. Office Space — 700,000 sq. ft.
Retail Space — 90,000 sq. ft.
A manual traffic count was conducted for 2 hours during the peak periods in the morning(7am to 9am) and afternoon (4pm to 6pm) at both the visitor entrance/exit on Milk St. and the resident entrance/exit on India Row. A traffic study conducted by the Chiofaro Co. in 2009 for a previously proposed, smaller development estimated 1600 additional (new) vehicular trips per day. The 2014 traffic study estimated that the current proposed 1.3 million sq. development would generate 2,240 new vehicular trips per day, which is an increase of 63%.